Experience head-to-toe cleansing in a single step with the Nuxe After-Sun Hair & Body Shampoo. A refreshing moment for your skin after a day in the sun, the Nuxe Shower Gel will remove all residue from the skin including salt, chlorine and UV filters. Free from soap and sulphate-based surfactants, the creamy formula is kind to both the skin and the environment thanks to its biodegradable formula. Enriched with a skin-softening, nourishing blend of water and sun flowers, the hair and body shampoo will leave the skin feeling cleansed, refreshed and subtly scented with a feminine, floral aroma. Use all over to refresh and cleanse the skin after a day in the sun. 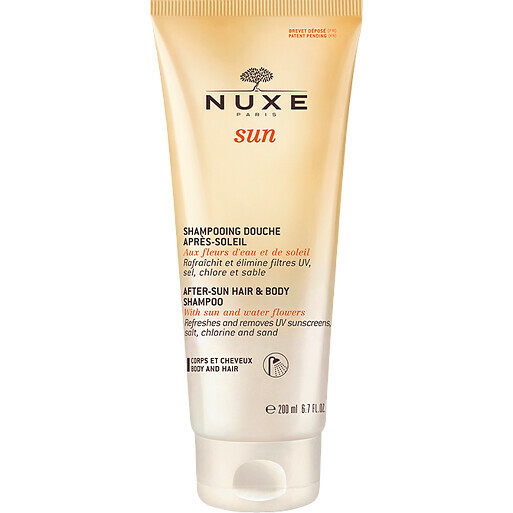 Nuxe Sun After-Sun Hair & Body Shampoo 200ml is rated 4.0 out of 5 by 1. Rated 4 out of 5 by kassandra05 from Pleasant and smell gorgeous Needed to have for a constant high sun exposure. Works well and have a good smell as most of nuxe products.